I keep trying to simplify church administration! Creating a document that listed our small groups was a time consuming task for us! No more – with 90 mins coding our PDF that used to take a lot of fiddling to fit, is now available at a click of a link on the Groups tab and any page that has the small group list shortcode or Gutenberg block. You can print them out for those that aren’t tech savvy! The background is a map graphic. You can change the PDF title using the Gutenberg options or title=”new title” in the shortcode. 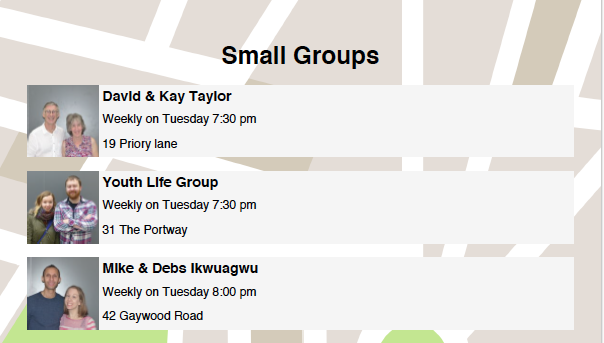 The default is a translation of “Small groups” for your locale. 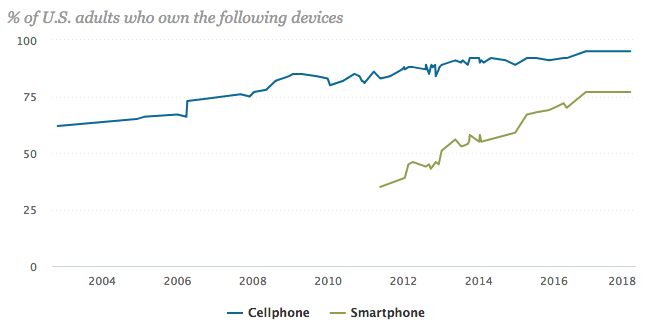 95% of Americans own a cellphone and 77% a smartphone. If you don’t have the app yet, it’s a worthwhile investment for most age groups in your church – it’s free for your congregation to install on their device and only GB £7.50 / US $10 per month for the church to buy into. It will mean your congregation can catch up with sermon mp3s, your schedule/rota/roster, calendar, groups, classes and even check into services and classes. Getting a church subscription funds plugin development too!